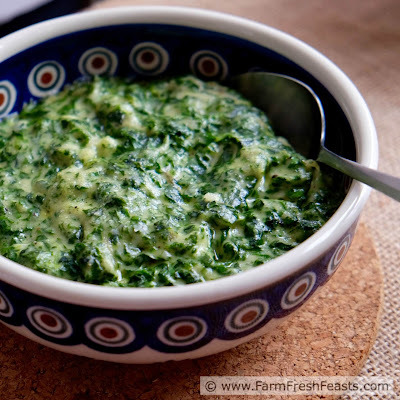 A vintage recipe for creamed spinach using just 6 ingredients and a bit of time on the stove. Make this while you've got other pots-needing-stirring on the fire, and you'll have a fresh green side dish to add to your holiday table in 15 minutes or so. Forrest Gump had the way of it. Life--with a Community Supported Agriculture (CSA) farm share--is like a box of chocolates. You never know what you're gonna get. Some things are a given--you won't get tomatoes in May. You won't get corn in October. You will get turnips and beets . . . Yesterday I learned what would be delivered in the Thanksgiving farm share box. On Tuesday I'll get my fresh turkey and a bunch of veggies. Now that I have a clue what I'll be working with, I can finalize my menu. Of course we'll have potatoes. My kids ask for MA's Make Ahead Irish Mashed Potato Casserole year round. No green beans this year--my spouse and I are the primary eaters of Alanna's World's Best Green Bean Casserole and I just don't have it in me to eat an entire batch alone. I will make a corn pudding--dairy free and vegetarian--to share with a neighbor who is hosting folks with a variety of special diets. I will use a bag of Multigrain Sourdough Bread cubes from the freezer to make a small batch of stuffing. I've already made a half batch of Apple Cider Beet Cranberry Sauce--substituting dried pineapple for the dried apricots and grated raw beet for the roasted beets--and updated the photos for that post. I'll need something green, though, and as a salad probably won't happen I plan to make creamed spinach. This recipe, from my 1950 edition of Betty Crocker's Picture Cookbook, listed as Spinach (French method) "makes most anyone enjoy spinach". It's easy to make if you're already at the stove for something else. 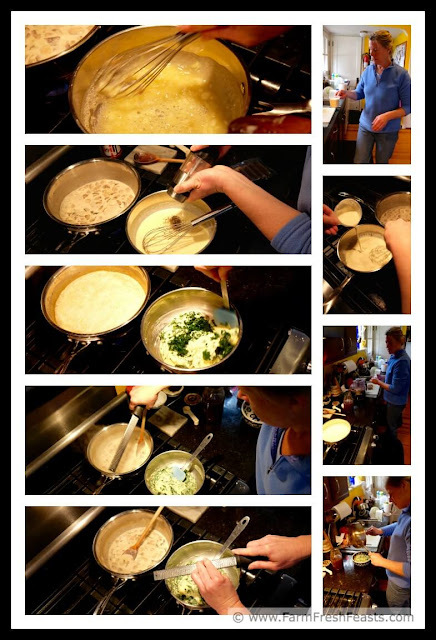 Last year, when my spouse took the action shots below, I was making Alanna's World's Best Green Bean Casserole and my Apple Sausage Cornbread Stuffing. Why not add a third recipe while I'm multitasking? In the time that it took the mushroom sherry cream sauce to thicken for World's Best Green Bean Casserole I fixed my Creamed Spinach, then used the same pan to sauté the onions and celery for Apple Sausage Cornbread Stuffing. 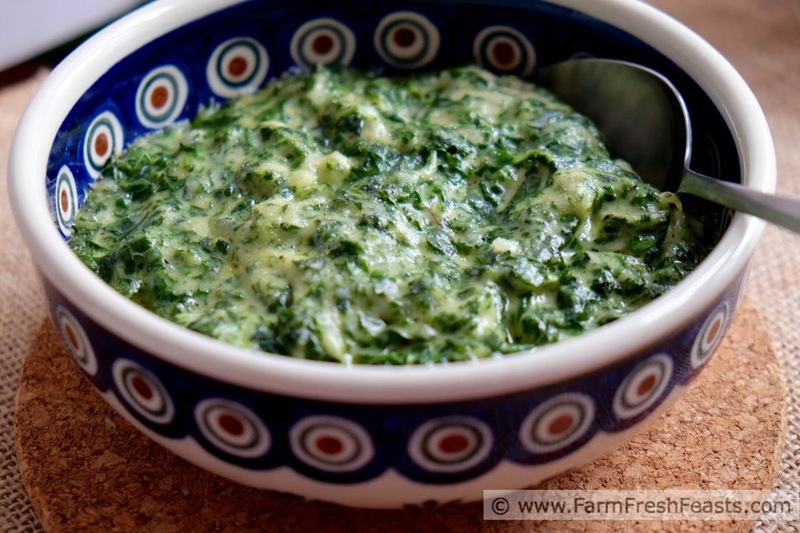 This recipe is just a thick white sauce, cooked drained spinach, and a hit of nutmeg. I got comfortable making a white sauce with the excellent directions in Melt: The Art of Macaroni and Cheese (Amazon affiliate link) . Don't let it scare you--this is very straightforward. Though unexpected events may occur, just roll with them. Last year I dropped my nutmeg into the spinach while grating it. I also broke my meat thermometer--in the turkey leg. I wonder what will happen this year? If you've got other things going on the stove but a free burner for 15 minutes, add in this recipe. Leftovers are good in Deep Dish Thanksgiving Leftovers Pizza and a Quadruple Roasted Mock Lasagna. 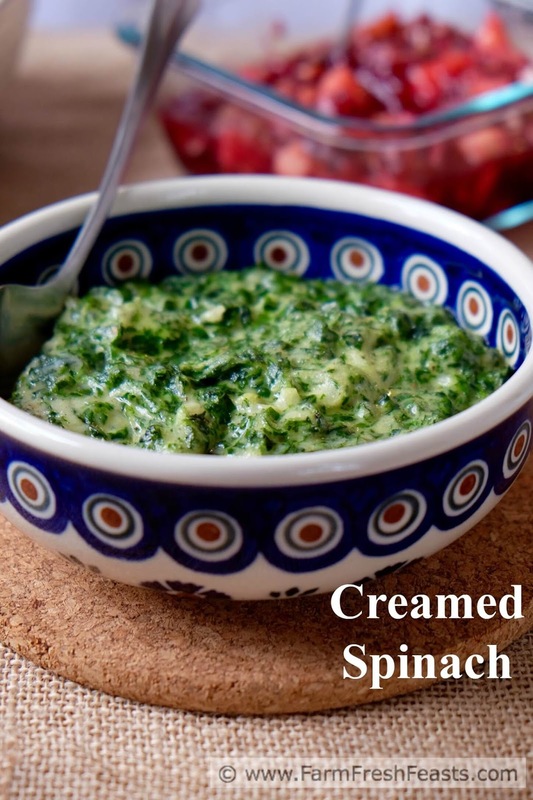 For more recipes using spinach, please see my Spinach Recipes Collection. It's part of the Visual Recipe Index by Ingredient, a resource for folks like me getting their local Thanksgiving supplies delivered this week (or hitting up the farmer's market on Stock Up Wednesday). I'm sharing even more ideas on my Pinterest boards, follow me there. What's going on in the kitchen is occasionally shared on my FB page. And, if you'd like to know how to Use This Blog just click. In a 1.5 quart saucepan over medium low heat, melt butter. Whisk in flour. Cook until bubbly, then add cream and seasonings. Increase heat to medium and cook, stirring, until thickened (about 10 minutes). While the sauce is cooking, rinse the spinach and briefly cook it. I did this in the microwave for 3 minutes on full power. Drain and chop (I used ALL THE TOOLS--my salad spinner and food processor--since I had them out). Stir the chopped cooked spinach into the thickened sauce. Season with nutmeg. Serve warm. This can hang out in a warm spot until you're ready to serve. I popped it into the oven for the last 10 minutes that the stuffing and potatoes baked so everything was hot when we served. I'll be sure to check that out if I'm ever in the area.